Data Recovery Suite 2.0 – 24 hours giveaway – Expired. An all-round recovery solution for both deleted and damaged files. 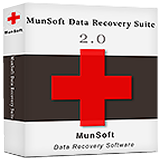 MunSoft Data Recovery Suite offers an all-round recovery solution for both deleted and damaged files. 6 programs give full protection to all types of documents, pictures, Office files and others. The programs use Raw Search in order to detect the recoverable data and extract maximum information. Every type of storage is supported. Each program has a preview that shows the exact amount of data available for recovery.